Chassis – The chassis can now count on a Unit Pro-Link rear suspension, however, with the new Free Balance Rear Shock Cushion, for a smoother, better traction and a greater excursion, thanks to new hydraulic system. 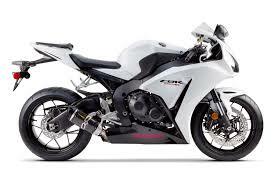 In 2012 CBR 1000RR devices for adjusting the compression and extension are left on top of the body. Even Honda as well as other Japanese manufacturers used a Showa Big Piston 43 mm upside-down. It ‘was also renewed the equipment, all-digital, also now have aluminum rims to twelve races. ENGINE – What does not change is the engine, which remains the four-cylinder of 999 cc with bore and stroke measurements of 76 mm x 55.1 mm and a compression ratio of 12,3:1, with distribution to four valves with dual overhead cam head. The engine delivers a maximum power of 178 hp at 12,000 rpm / min and a maximum torque of 112 Nm at 8,500 rpm / min. The gearbox has six gears. The only novelty is the remapping of the ECU of the injection, for delivery more linear.